Gas-charged cartridge forks, which became available in 2007, consist of gas-charged cartridges fitted within standard forks. This kit is suitable for supersport classes of racing, where regulations prohibit a complete fork replacement but allow modification of the original forks. While excessive brake dive is disconcerting, and bottoming out can cause loss of traction, a certain amount of brake dive reduces the rake and trail of the motorcycle, allowing it to turn more easily. This is especially important to racers trail braking on entrance to corners. PDF (Posi Damp Fork): This was fitted to the Suzuki RG500, the GSX1100E/GS1150E and GSX-R 750 and was an enhancement of the previous Anti Dive units (which works by brake fluid pressure closing a valve in the mechanism when the brakes are applied, restricting the flow of damping oil and slowing fork compression). The PDF units works in a similar way, except that they rely entirely on the compression stroke itself. The valves are spring-loaded so if the wheel hits a bump, they bounce off their seats and restore the flow of oil for a moment to allow the suspension to absorb the shock. When a swingarm is present on only one side of the motorcycle, this is known as a single-sided swingarm. In 1981 BMW introduced the single sided swingarm (mono lever) to motorcycles on their R 80 GS model. Notable examples include the Honda VFR800 and the BMW R- and K-series. Single-sided swingarms make rear-wheel removal easier, though they generally increase the unsprung weight of the rear suspension. This is due to the additional material required to give identical torsional rigidity to a conventional (two-sided) swingarm setup. For this reason sports bikes are rarely seen using the setup. Notable exclusions are the Ducati 916 which was intended to be taken endurance racing, the MV Agusta f4 which has a hollow interior for reducing weight (a magnesium version is also available), and the Ducati 1098, which was given a single sided swingarm purely for styling reasons. 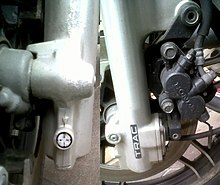 For motorcycles with chain drives, the rear axle can usually be adjusted forward and back in relation to the swingarm, to adjust chain tension, but a few models (such as some 1971/72 Triumph and BSA four-strokes and Ducati 860 GTS and Darmah 900s ) make the adjustment at the swingarm's pivot point. Twin shock refers to motorcycles that have two shock absorbers. Generally, this term is used to denote a particular era of motorcycles, and is most frequently used when describing off-road motorcycles. During the late 1970s and 1980s, motorcycle rear suspension design and performance underwent tremendous advances. The primary goal and result of these advances were increased rear wheel travel, as measured in how far the rear wheel could move up and down. Before this period of intense focus on rear suspension performance, most off-road motorcycles had rear wheel travel of about 3.5–4 inch (9–10 cm). At the end of this period, most of these motorcycles had rear wheel travel of approximately 12 inch (30 cm). At the beginning of this period, various rear suspension designs were used to reach this degree of performance. However, by the end of this period, a design consisting of using only one shock absorber (instead of two) was universally accepted and used. The performance of single shock absorber suspensions was vastly superior to twin shock motorcycles. Accordingly, this design distinction is readily used to categorize motorcycles. With the exception of Bentley and Draper system (New Imperial and Brough Superior machines) and the HRD (later Vincent) system both developed and patented in the 1920s it is only since the 1980s that monoshock motorcycles have been the norm, the term "twinshock" is now used to categorize vintage motorcycles. This distinction is important in that it provides classes used for vintage motorcycle competition. For example, vintage motocross races are held for older motocross motorcycles. To prevent the better-performing monoshock motorcycles from dominating the competition, there are separate competition classes for monoshock and twinshock motorcycles, which prevents them from competing directly against each other. On a motorcycle with a single shock absorber rear suspension, a single shock absorber connects the rear swingarm to the motorcycle's frame. Typically this lone shock absorber is in front of the rear wheel, and uses a linkage to connect to the swing arm. Such linkages are frequently designed to give a rising rate of damping for the rear. In 1972, Yamaha introduced the Mono-Shock single shock absorber rear suspension system on their motorcycles competing in the Motocross World Championships. The suspension which was designed by Lucien Tilkens, became so successful that other motorcycle manufacturers developed their own single shock absorber designs. Honda refers to its single shock absorber design as Pro-link suspensions, Kawasaki as Uni-Trak and Suzuki as Full-Floater. Honda's Unit Pro-Link, used first on the Honda RC211V MotoGP racer, and then on the 2003 Honda CBR600RR sport bike, is intended to isolate the frame and the steering head from undesirable forces transmitted by the rear suspension by having the dampers upper mount contained within the rear swingarm subframe, rather than connecting it to the frame itself. ^ "Cartridge Forks". www.racetech.com. Retrieved 1 April 2018. ^ a b "Torsten Hallman 2005". mxworksbike.com. Retrieved 2017-09-04. Motorcycle Mechanics Institute (1984). The Complete Guide to Motorcycle Mechanics. Prentice-Hall. ISBN 0-13-160549-6. Schwietzer, Andy (May 2008). Reinken, Berthold (ed.). "Von Mücken... ...und Bienen" [Of mosquitoes ... and bees ...]. bma Motorradberichte (in German). Bremen, Germany: Verlag Boris Deiszler: 36–39. Archived from the original (pdf) on 2011-07-05. Retrieved 2012-02-25. Wilson, Hugo (1995). The Encyclopedia of the Motorcycle. Dorling-Kindersley. ISBN 0-7513-0206-6. Wood, Bill (December 1999). Wood, Bill (ed.). "Sticker Shock". American Motorcyclist. 53 (12). ISSN 0277-9358. Cameron, Kevin (1998). Sportbike Performance Handbook. St. Paul MN: Motorbooks. ISBN 978-0-7603-0229-3. Robinson, John (1990). Motorcycle Tuning: Chassis. Oxford: Butterworth Heineman. ISBN 0-7506-1840-X. Foale, Tony (2002). Motorcycle Handling and Chassis Design. Spain: Tony Foale Designs. ISBN 84-933286-3-4.